Last week, I went to a Arduino camp that took place on the campus of High Tech High School. What is Arduino, you may ask? Arduino is an open-source programming language that controls a small chip called an Arduino Board, which you attach to your computer via a USB cable. This chip can be connected using wires to many other components, such as a breadboard with LEDS and speakers, or even a shell with a motor and wheels. In order to make something with Arduino, you must complete two processes: coding the software, and connecting all the wires and transistors in the right places, starting from the Arduino board and onto the other components. The wires, LEDS, and all accessories have little needles at the bottom of them to attach to holes in the breadboard and processing chip. Arduino has infinite possibilities with what you can create using it. At the camp, my partner was a kid named Spencer (shoutout to him, I showed him my blog's address so he may be reading this right now). We made several things, such as a light that detects dark and then lights up, a speaker that plays a very pixelated version of "All Star" by Smash Mouth, and a little thing we called the "Seizure Light". We used a tri-color LED and coded it so that it switches between colors every few milliseconds, so it flashes very fast. Just don't stare at it too long, it can give you a headache! Above, you can see one of the robots that we made, for a contest we had at the camp. There was an obstacle course arena made out of books and pencils, and between two teams whoever's robot made it to the end first won. Spencer and I named our team "Shrek", obviously. Everyone's robot had a thing like a Roomba where it would go the other way before bumping into a wall. We first attached little antennas to the front that whenever they touched a wall, they would vibrate and the robot would know to turn the other way. A more efficient way of wall-avoiding was by attaching an IR camera to the front. IR stands for Infa-Red, and it sends invisible light in front that can sense its distance to objects, so whenever it gets within three inches of an object it turns around the other way. We would put our robots with IR cameras into the obstacle arena, and we would race other teams, and with random luck a robot could win. Each time it senses something in its path, it would turn the other way, thus slowing down its progress. We entered this race with our robot, and we added some special custom modifications to our robot. Whenever you opened it up, it would play a start-up sound with its buzzer, which was "All Star". (We were at first considering to go old school and put in the iconic Windows XP startup sound, or even the Nokia 2000 ringtone.) We attached our Seizure Light to the top of it, and coded it so that whenever it detected an object in its path, the tricolor LED would switch to red for a few seconds, before turning away and going back to strobe-mode. In the end, our robot ended up winning the tournament. Hooray for Team Shrek! If you don't know who Bonzi Buddy is, look it up. He appears in a YT livestream by Vincesauce Joel called "Windows XP Destruction". To make a long story short, he was an old desktop assistant that actually was a trojan virus that stole people's info. (Think of a malicious version of Siri.) The program came out in 1999, but was shut down in 2007. Now you can still download him, but it is safe for the most part since the trojan code is outdated in all modern computer systems. You can, but it would be better not to. He is completely useless. All it does it just tell corny jokes and pop up on your screen at the most annoying times. We made a GIF party version of him, with a fake virus warning banner on it to prank our friends with: bonzibuddyexe.corgiorgy.com. Be sure to turn on your volume at the site, we have annoying laughing sound effects that start eight seconds after you open the site. Remember back when Nintendo was sued for the Wii's motion controller by some guy who claimed that he had the idea first? 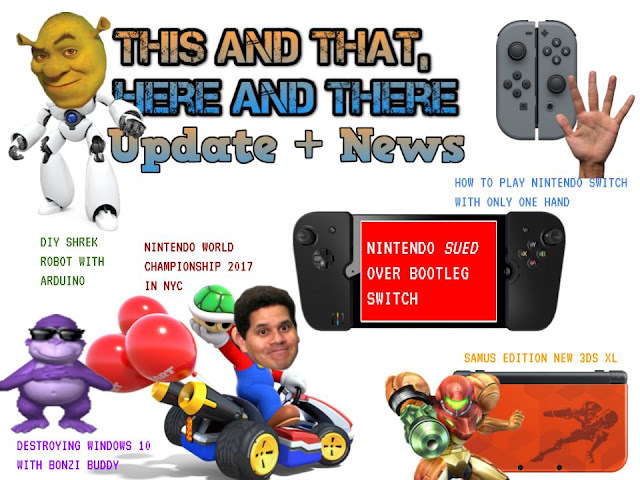 Well, Nintendo has been sued again, for another ridiculous reason. 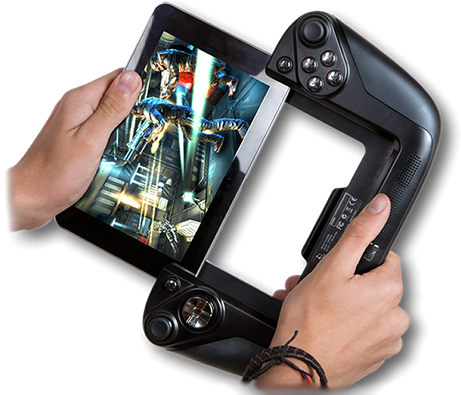 Gamevice is a company that makes special cases for iOS and Android phones and tablets that double as bluetooth controllers for mobile gaming. The company has existed before Nintendo even announced the Switch. Gamevice's product is not unique, however. There are plenty of other companies that sell similar tablet controller-attachments, such as iPega and Logitech. 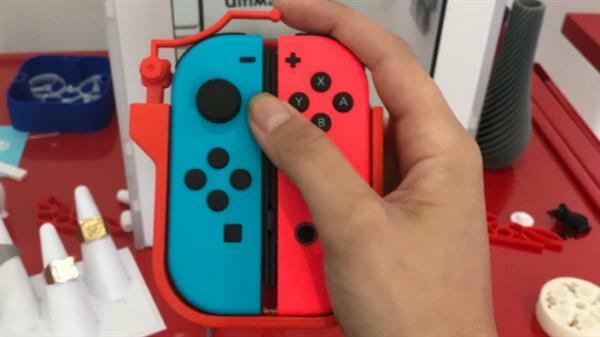 On August 11, Gamevice issued a lawsuit against Nintendo saying that the concept of the Switch's Joy-Con controllers infringed upon a patent that they had filed back in 2015. The patent was never publicly released until now. The patent describes a pair of control modules that could be attached to a separate computing device. The patent became the basis for the WikiPad, a tablet device released in 2013. This sounds an awful lot like the Switch, I have to agree. But once you see what the Wikipad actually looked like, it isn't that much like the Switch. 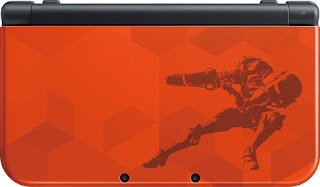 It resembles more of a Wii U gamepad. The Gamevice wasn't very well known or popular (it only got 30 Amazon reviews), so Nintendo may at least have the benefit of doubt for copying off. Nintendo acted like what any smart business would, and did their research to find out that there were similar tablets with controller attachments already in existence, so tried to make their product different as possible, or they didn't worry about it since their product already was different for many reasons. The controllers can each be used as a separate controller for multiplayer, the tablet itself is a home console that can be connected to the TV, they have motion controls and an IR camera, etc. They got the idea over time, as they were developing several consoles, they learned what works and what doesn't. You can see Nintendo's entire history with the Switch. Its as if all their previous consoles were combined. It has the button layout first introduced by the NES, analog sticks like the N64, portability like the DS, motion controls like the Wii, and a similar layout and touch-screen as the Wii U. The idea of the Switch being an evolution of Nintendo's history as a business was even brought up by a company executive at the beginning of the Nintendo Switch unveil presentation back in December 2016. I think the reason that Gamevice didn't sue back when the Switch was publicly unveiled, but instead waited until now, was because they didn't know yet whether the Switch was going to be successful. Now that the console has sold over 5 million units so far, they know that its a big hit and they want some of that money. I don't think that it has much to do with idea infringement, Gamevice is just being greedy. 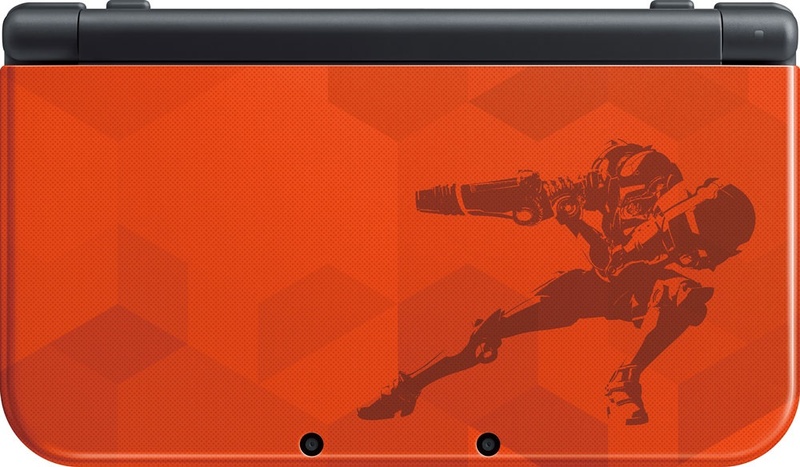 Nintendo fans shouldn't worry, the case will most likely be won by Nintendo. In the words of Reggie Fils-Aimee, CEO of Nintendo of America, "Their bodies are ready." Today and yesterday, gamers from around the nation had a chance to compete in Mario Kart 7 for a chance to go to the final round on October 7th. The qualifier rounds, held August 19 and 20 in the Bronx, New York City, take place in the Bronx Terminal Street Best Buy. While they are there, people could try out two of the most anticipated games of the year, Mario Odyssey for the Switch and Metroid: Samus Returns for the 3DS. This is one of 8 stores in the entire country to host the qualifying round of the 2017 Nintendo World Championships. I wish that I could go, since NYC is an hour away from where I live, but my parents didn't let me since highly unfortunately, we had IKEA shopping that same day. I have never hated meatballs, expensive furniture, and tiny pencils so much in my life. I really wanted to try out the new Mario Odyssey and Metroid, as well as a hand-on with the New 2DS XL (which I am considering buying), but oh well. Mario Odyssey comes out on October 27th, I should just be patient and wait for it, without a sneak-peek. I may be good in Mari Kart, but I am sure that there are others out there better than me. It was divided into two age groups: 12 and under, and 13 and older. I could technically be counted as the first age group, so maybe competition would be a little easier. It took place this weekend for NYC, and will take place on different dates for San Francisco, LA, Miami, Chicago, Seattle, Minneapolis, and Dallas. 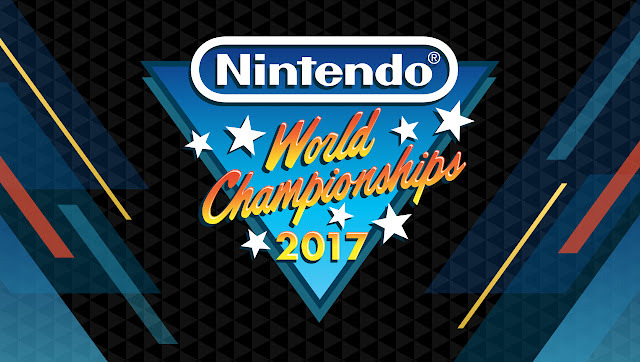 To see when it will take place in your area, go to the official NWC page on Nintendo's website. Video games are a very enjoyable pastime that can be enjoyed by people of all ages, genders, and locations. Most of the time, people with disabilities that cause them only to be able to use a single hand cannot play video games, since the traditional controller requires you to hold it and press multiple buttons at the same time using two hands. A designer called Julio Vazquez wants to change this. He designed a 3D-printed accessory available for free download on his website, that can be connected to the Joy-con controllers and it is possible to use it with only one hand. There are two versions of the grip, the right-angled one (shown in the image above) and a side-by-side version (shown in the image below). The creator says that the right-angled one is more suited for lefties. 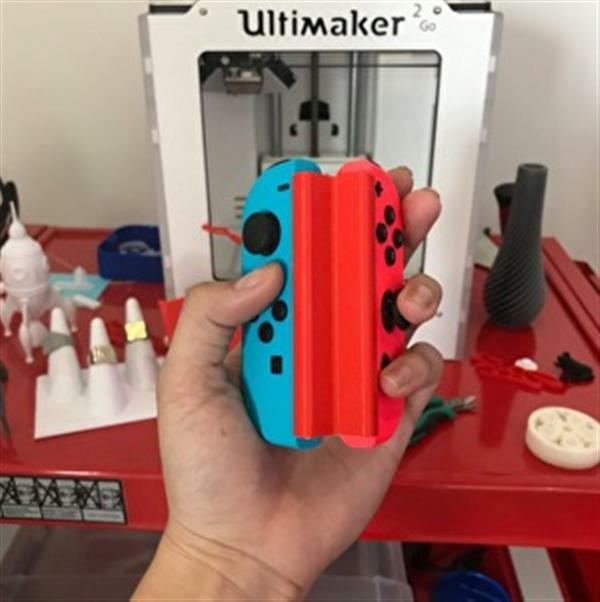 It requires a 3D printer with 0.3 mm resolution The side-by-side accessory requires an infill of 40% and supports. The right-angle version does not need supports, and can be printed with 25% infill. Both are printed in PLA, but other materials can stll be used. The cool thing is that the side-by-side version is decorated like a Sheikah slate from The Legend of Zelda: Breath of the Wild. In the video above (which is in French but English sub-titles are turned on by default), it is explained how to use this accessory with one hand. You can spread your hands across the two controllers, and with the correct finger positions and enough practice you should be able to do even the most complicated of button inputs in Switch games. 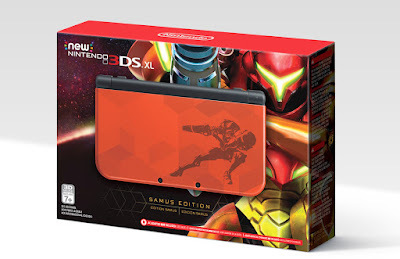 Nintendo announced a new design for the New Nintendo 3DS XL that is inspired by the Metroid game series. The image above shows the view of it folded, and the front and back view of it opened. 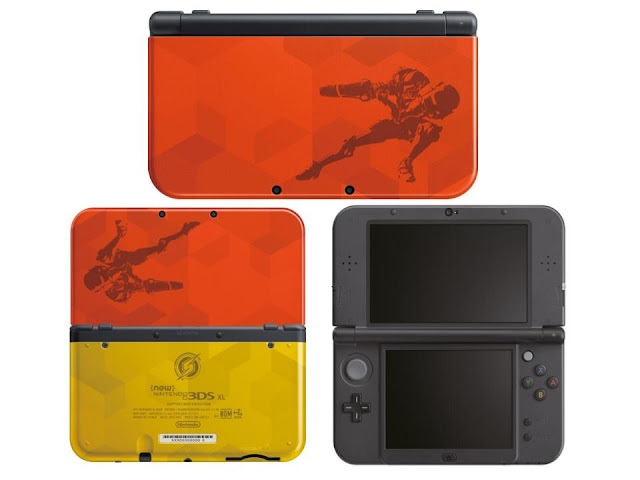 It has an awesome-looking design with Samus on the top, cool textures, and awesome and vibrant orange and yellow colors. On the bottom, they have the Metroid logo as well. It looks very awesome, but I probably will never get it because it will be persumably rare and hard to find in stock. Pre-orders are still in stock at Game Stop and Best Buy (but out of stock on Amazon), but even though I want to upgrade my 2DS to some sort of New 3DS model, I will wait until Black Friday when there are usually many cool special edition 3DS'es for the cheapest they'll ever get. If you actually took the time to read through all of this, thank you! I know that its really long, but I have lots of different topics to talk about and I want to stick to one or two posts per day. I have more posts planned once per day for the rest of the summer. This week, I will be reviewing every the Nintendo Switch and every one of its games that have been released so far. My schedule, subject to change: "1-2 Switch" game review (Monday), "The Legend of Zelda: Breath of the Wild" game review (Tuesday), "Mario Kart 8 Deluxe" game review (Wednesday), "Arms" game review (Thursday), "Splatoon 2" Game review (Friday), Nintendo Switch console review (Saturday or Sunday). I am almost at 100 thousand views! Can we reach it by the end of the month? See you next time! BBBYYYYYYYEEEEEE!!!! I just found out some breaking news after I finished and published this post!!! BREAKING NEWS! : The Return of Xiang' Old Blog, "Past, Now Future"
Xiang, the creator of the blog REEL-X ROYALE used to have an old blog called Past Now Future but he quit it to start over in Reel Royale. His latest post in Past Now Future says that he plans to do both blogs at the same time.